So how soon should you start packing? Being as handy as the next bloke at packing, but being definitely better than the average guy at procrastination, I figured that I could do it next weekend, which is when I go after all. Sounded like a plan to me. Seems I was wrong. Seems I was being told to pack a week ahead of time! This seems overkill for me, but as the prospect of not unpacking and packing all over again all seems fairly remote regardless, as I will no doubt have several panic attacks whereupon I decide that I haven’t packed enough, or can’t find something, and it will all end up all over the floor again! Anyway, armed with a list, and another list, and some help (much needed:)), I went at it. After some time, my bag was packed to heaving with the things that I need, or want. Only problem is, that not all of them will go in! I am going to need a rethink I believe. 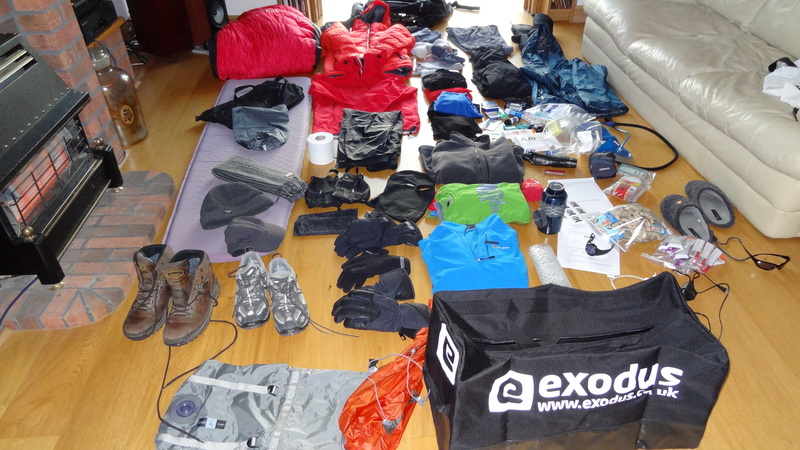 I also have managed to include just three T shirts, one jumper and two pairs of walking trousers, and that is the total sum of my clothes for eleven days away! Hmmmmm, not going to happen. Then I realised that there were certain things that I didn’t have yet. These include a memory card for my camera (I have ordered three so far for my new camera, and none have arrived. Long story there , don’t get me started on it), a charger of any description for my phone and a few other bits and pieces. 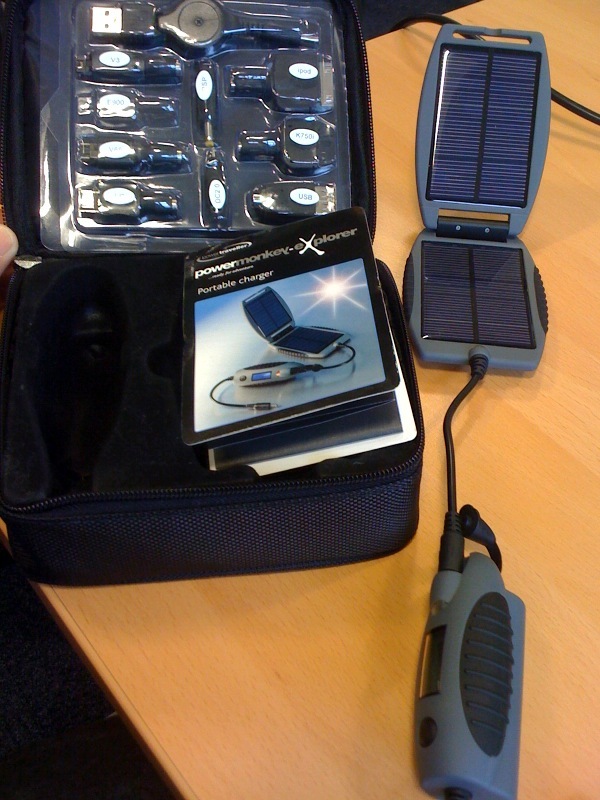 I had heard via travbuddy of the Powermonkey, a portable solar charger for mobile phones, so I thought I might just have to have one. I use an iPhone normally, and the battery on that won’t last me a day without being charged, so it would be useless on the mountain. In fact I had already decided to take my Blackberry instead in the hope that the battery would last. I would love to be able to text Dan and Becca when I get to the the top, and to at least tell them that their old Dad made it to the roof of Africa, although just saying that is no doubt tempting fate. So anyway to cut a long story short, I managed to get said Powermonkey courtesy of Cotswold in Bicester. It’s quite nifty, and fairly rugged, and works:). It costs £65 normally, but they knocked me 20% off by virtue of the fact that I am doing a trek, so good for them. So with a few more of these types of things stuffed into various pockets of my rucksack and my large duffle bag, everything seems to be coming together. Still way off deciding on what clothes to take though. I read someone’s blog today which said that on summit night they had 7 layers on the top half of their body and 4 on the bottom. I am not even taking that amount of clothing altogether! That poem has so much passion and meaning for me. I will be reciting it up a certain mountain for sure. I had a re-assessment of my levels with Tombo, a great young ex-Zambian personal trainer guy who has given me all sorts of new exercises to work on. He has shown me a great rowing machine exercise, and then strange things like Spiderman push-ups and stuff. I felt the benefits like straight away (or maybe it is just the pain in my badly out of condition belly that can feel the pain). So tomorrow night I will practice them more. I know it is too late now to affect how I am fitness-wise for the mountain, but it is not too late to at least stay in shape, maintain what I have. I actually feel pretty good about it all right now, as far as fitness is concerned. There are many unknown things to cope with, but if I don’t know about them then I can’t deal with them can I!